The Enviroblue Popular 26kW Boilerhouse is a floor-standing, condensing, Regular oil boiler that has been designed and manufactured by Firebird. 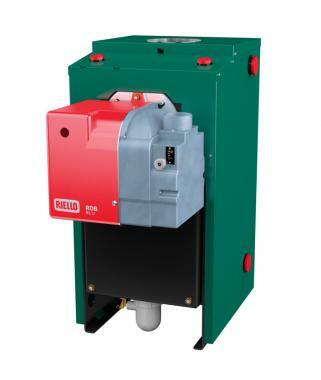 Firebird has designed this boiler as a boiler house boiler which means it is able to be placed in an Boilerhouse garage or outbuilding, saving space in the home. To minimise heat loss, the boiler has fully insulated casing. A seasonal efficiency rating of 93% and an ErP A rating make the Enviroblue a highly efficient boiler that could help to save you money on your energy bills. The 26kW output makes it suitable for homes that don’t have such an excessive need for heating and hot water. Also in the range are outputs of 20kW and 25kW so if your heating demands are higher or lower than this model, there’s still a unit to suit your home. As a Regular boiler (Heat-Only or Conventional), it needs to be installed as part a heating system alongside a hot water storage cylinder, cold water storage tank and a feed and expansion tank. This means that it isn’t particularly suitable for smaller homes where space is limited. The features of this boiler include blue and yellow flame options, constructed using premium steel, a PCB controller, highly accurate thermistors, anti-cycling function and multiple tapping points for ease of installation, a patented heat exchanger and multi directional flue options for flexibility in where it can be placed. The Enviroblue Popular has a high performance MHG / riello RDB blue burner that is complete with full diagnostic control box. Plus, a 2 year warranty will help to give you the peace of mind that this boiler isn’t going to let you down after installation.